Why is this the Worst Golf Tip? We’ve all heard this classic piece of bad advice from a well meaning friend or misguided pro. The problem is, this advice is so general and non-specific that its meaning is completely dependent on your unique interpretation. This makes it totally worthless, and more apt to screw your swing up than fix any problem it was intended to. In the video above 3 time RE/MAX long drive champ Mike Gorton explains why he thinks “keep your head down” is such bad advice, and what you should be doing with your head instead. As you saw in the video, its normal to move your head in the golf swing, after all it’s an athletic movement and you are not a machine. Any attempt to keep your head in one spot will result in all sorts of mishits. Instead try focusing on keeping your swing below your head. You don’t want your head getting in the way of your torso and shoulder rotation in the golf swing, as if its some immovable object. No, you want your swing to be natural and comfortable. Lifting your head a bit to keep it out of the way of your shoulder rotation allows a natural swing and improves your mobility. As explained in the video, you want to feel like your swing is happening below your head. Focus on that feeling instead of keeping your head still. This will result in better swing mechanics and fewer mishits. For more tips on longer and straighter drives from 3 Time RE/MAX long drive champ Mike Gorton click here. We’ve all heard it time and again – power in the golf swing comes from the core. The problem is, unless you know how to properly use your core, this advice does little good. That’s about to change. In the video above you find award winning golf instructor and PGA Pro Greg McHatton explaining how to develop massive power from your hips. The kind of raw power that translates into 300 yard drives. As you can see Greg’s teaching methods can be a bit unorthodox, but it works, and that’s all that really matters. This drill is all about learning how to “drag” the club toward the ball using your core, instead of flipping the head of the club at the ball with your wrists. The key to making this dragging motion work is using your core. Your hips lead this dragging motion by sliding forward. That’s where the golf cart comes in. We can all slide our hips forward, the question is can we do it in a way that delivers serious power to the golf ball. By forcing yourself to push up against a heavy object, like the golf cart, you will naturally put your lower body into a powerful position. This means your right foot is firmly planted driving into the heavy object and your knees don’t collapse toward each other. This is also a perfect drill to teach you how to use and feel the ground in the golf swing. You can’t hit 300+ yard drives without feeling and using the ground beneath you. The trick is ingraining this feeling into your body so you can repeat it without a heavy object to push against. Once you do that you’ll be able to tap into a whole other level of power in your golf swing. This drill should help teach you how to lead your downswing with your hip slide, not your arms. The hips accelerate the club longitudinally, one of the keys to developing pro level club head speed. If you aren’t sliding forward you are missing out on this crucial longitudinal acceleration. Hey it’s Doc again with another free golf tip for you…this one’s about hitting the ball longer and straighter so listen up. Many golfers have a hard time developing the kind of raw power from their lower body that would help them hit the long drives they dream about. For most of them the problem has nothing to do with any lack of ability, instead the problem is in their head. As you saw Darrell explain in the video the subconscious mind can play tricks on us in the golf swing. We put so much focus into the little white golf ball at our feet that we unknowingly slow or halt our pivoting action once we reach the object of our focus, the golf ball. As you can imagine this has devastating consequences not only for the distance of your golf shots, but their accuracy as well. How can you fix this distance robbing problem? As you saw in the video it’s pretty darn simple. It’s time to turn the tables on your subconscious mind. Instead of it playing tricks on you, you are going to fool it into focusing on something beyond the golf ball. That’s where the cardboard box comes in. Having an object to focus on that is well beyond the golf ball will teach you to accelerate beyond the golf ball. This in turn will prevent you from decelerating at impact or stopping your rotation too early. All you need to do is place an old empty cardboard box 18 to 24 inches in front of where your golf ball would normally be. The box should now be the focus of your swing. Put all your energy into smashing it to pieces. Keep in mind you’ll be hitting the box with the toe of your club, don’t try to hit it with a square club face. The best part is, this golf club head speed boosting trick is easy as pie. There are no tricky concepts, no tedious techniques; all you need to do is spend 20 or 30 minutes beating an empty cardboard box to pieces. Do this once a month or so, just to remind yourself how it feels. If you want to you can buy a special bag that’s made for this purpose. The result will be longer drives without a whole lot of effort. Just remember to use an old club with a steel shaft for this drill. You don’t want to accidentally snap an expensive club. 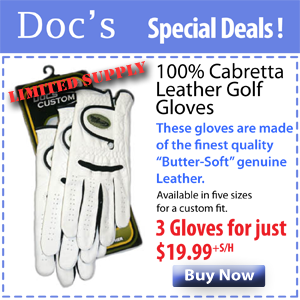 For more no nonsense golf tips that’ll boost your drives and slash your scores check out Darrell’s Signature Package. You’ll be glad you did. Doc O’Leary here with another free golf tip for you. This week its all about hitting longer drives. It’s practically impossible to hit long consistent golf drives without having a setup routine you follow each time you walk up to a tee shot. Even more important, you’re routine should be simple, quick, and get you in the optimum position to fire off long drives time after time. In the clip above, Bobby Schaeffer showed you how his simple routine prevents several common mistakes and prevents you from over-thinking the shot. Proper Alignment is the first goal of any setup routine for you golf shots. Setting up too close or too far from the ball is a guaranteed way to send a tee shot into the trees. The best way to prevent this is to align the club to the ball and the target, then setup your stance based on where the handle of the club is. One important thing to remember is that the higher you tee up any golf shot, the more you have to align the golf ball toward the toe of the club, when the club is resting on the ground. Aligning the ball off center, toward the toe of the club, allows for the extra inch or two of arm extension at impact. Making this small adjustment ensures that you are striking the ball on the sweet spot instead of the heel of the club face. Okay now that the golf club is lined up properly to the ball it’s time to get your feet set up. As Bobby shows in the video above, using a few clubs to create a line perpendicular to the target is a great way to help you visualize your setup when practicing. Use this perpendicular line as a guide when you step into the shot. It will ensure that you are placing your left foot in the right spot, then you can choose a placement for your right foot based on comfort. It’s the alignment of your left foot that needs to be precise. Many golfers walk up to a tee shot and then take some shimmy steps to get comfortable. This may work sometimes, but it often leads to shifting your left foot out of position, all for the sake of getting comfortable. Using Bobby’s method you can still get comfortable, while maintaining proper alignment. The final aspect of a good tee shot routine is pace. It shouldn’t be rushed, but it should be brief and to the point. Don’t waste time standing over the golf ball. It will only get you thinking too much and throw your mental game off. As Bobby said in the video it’s best to think of it like riding a bike, you know what to do, there is very little to think about after the setup. Now that you have proper alignment nailed down your tee shots will wind up in the fairway a lot more often. All that’s left is adding some serious “umph” to your swing, so you can start nailing those monster tee shots, you know…the kind that make you smile from ear to ear. I personally can’t think of a better Christmas present for any golfer to give to himself than the gift of ridiculously long and accurate tee shots. That’s why I’m running a killer deal on one of my hottest “long drive” packages, Bobby Schaeffer’s Beyond Long. Just use coupon code [XMAS2015] without the brackets at checkout to get 20% off the Beyond Long DVD Package. If you want longer more consistent golf shots with fewer fat, duffed, topped, and thin golf shots you need to think a bit about your ball position. Each golf club you have in your bag is a different length. This means each club has a slightly different swing arc. What does this mean for your golf shots? Well if you hit your seven iron perfectly then took that exact swing and used your five iron you would hit a fat shot. The solution is not to change your swing, rather you want to change where the ball is in your stance. Changing your swing leads to terrible inconsistency. Changing the position of the golf ball in your stance is simple repeatable and easy to do. The best part is that since the lengths of standard golf clubs vary in half inch increments it’s actually quite easy to figure out where each club should be in your stance. Keep in mind there is no hard and fast rule when it comes to ball position, but using this guide will get you pretty close to what will work best for you. The easiest way to determine the best ball position for each club is to use the seven iron as your standard. The seven iron is the middle length club and should be played in the middle of your stance. Since the eight iron is a half inch shorter it should be played a half inch further back in your stance, and a nine iron should be played a full inch back from center. For longer clubs you’ll move the ball forward in your stance in half inch increments. The driver is where people have the most difficulty with ball position. The driver is the longest club in your bag and you have probably been told by instructors, magazines, book, or buddies that when hitting your driver the golf ball should be lined up with the inside of your left heel. I’ve got some news for you, unless your driver is still made out of persimmon wood with a hickory shaft playing the ball off your left heel is simply wrong. Standard driver shafts back in the old days were 43.5 inches long. To be fair many drives were still 43.5 inches long up until about 10 years ago, so your buddy’s advice is outdated but not ancient. The point is most new golf drivers are somewhere between 44.5 to 45.5 inches long. If you were paying attention earlier you know that a longer shaft means these newer golf drives must be played further forward in your stance. The old guide of using the inside of your left heel won’t work anymore. For long consistent golf drives you need to play the ball a full inch to an inch and a half further forward. Don’t worry you don’t have to get out a ruler when teeing up. Simply swap the “inside of your left heel” quick guide with “inside of your left toe”. It’s as simple as that. This slightly more forward ball position will compensate for the longer driver shafts and swing arc. The result is a square club face at impact along with longer, and more consistent tee shots. It doesn’t much easier than that. 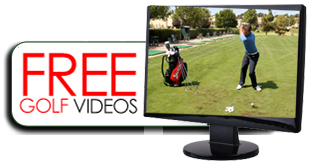 For more simple golf tips to improve your swing and your scores click here. One of the biggest challenges in golf is that on the golf course there are hundreds of different types of shots you may need to make, yet you only have 14 clubs in your bag. The solution, learn to hit clubs in many different ways. That’s where this golf tip from PGA Golf Pro Marc Minier comes in. In this video he shows you one of the many ways you hit a hybrid golf club. The “Floater” shot is great when you need to get some serious distance (maybe from a not so good lie) but need the ball to get high, land softly, and have a short roll. Your traditional 3 or 4 iron simply won’t cut it for this kind of situation. To hit this shot you need to do three things. First, put the ball at the front of your stance (off your left toe). Second you need to close your stance so you aren’t reaching for the ball. Third keep your shoulders aligned with your target. When you swing you are going to be swinging the golf club a bit softer than normal. You also want to make sure you are swinging the club along your shoulder line not along your stance. The result should be a nice shot that gets high, carries a bit shorter than a full swing and doesn’t roll too far. Perfect for when you need a long shot to stick on a green. This shot should also fade a bit due to your closed stance and outside-in swing path. This is just one more way to improve your game using hybrid golf clubs. As Marc said in the video you simply can’t do this with a 3 iron. Not to mention the fact that hitting a solid shot with a hybrid is so much easier than hitting a 3 iron. If you don’t yet have any hybrids in your bag I recommend you check out my Hot Metal Hybrids. You’ll be glad you did. As you know the power in your golf swing is developed in your core pivot, not your arms. This is a problem for many of us as we age. As we start to lose flexibility we stop being able to twist our backs and shoulders like we used to. Because of this we start losing power and yards from our golf shots. The body lean golf tip in the video above will help you get your back and shoulders to rotate more in the back swing so that you can get more power out of your golf swing. If you don’t get your back and shoulders into your back swing you will naturally start relying on your arms which will not only cause you to lose some serious distance, but also lead to a number of other nasty problems in your golf swing. Simply open up your right foot (left foot for lefties) pointing it slightly backwards. Lean your spine back so you are behind the ball, with your shoulders slightly turned behind you at address. These simple little tweaks to your golf swing make it much easier for your joints to twist the way they need to get the most out of your golf swing. As Marc said in the video this little trick will also help you stay behind the golf ball during your swing. Many older golfers have a tendency to get in front of the ball too early in the swing, a problem that also robs power. Oh and before I forget, you know that stinger shot that Tiger Woods always uses, well Marc Minier has finally decided to demystify the whole thing so average golfers like you and I can start using this little trick. I convinced him to put together a new video where he breaks the whole thing down and shows you exactly how to hit that stinger shot. It’s simple to use and it can shave some serious strokes from your golf scores. To learn how to hit the Stinger Shot Click Here. When it comes to loading your wrists the biggest mistake golfers make is to start loading from the start of their back swing. This is a big mistake. This will prevent you from using your core as your swing engine and cause all sorts of consistency problems in your golf swing. As Nick says in the video you need to have a one-piece take away. That means you start the back swing with your hips, torso, and shoulders; never with your hands. When your hands are level with your belly button or a little higher you can start loading those wrists. Just remember that you need to have a flat left wrist and a bent right wrist at impact to deliver maximum power to the ball and hit long consistent drives. Loading your wrists allows you to create a more powerful golf swing. It is important to keep this power stored (with a flat left wrist) until you deliver it into the ball at impact. Remember proper wrist conditions at impact are the key to consistent ball striking. Proper wrist loading is just one part of a natural swing sequence. As you can see in the video, Nick, who is not a large guy (he’s about 150 pounds) utilizes great technique and proper swing sequencing to consistently drive the ball 300 yards. His close attention to technique allows him to use his body effectively and out drive guys who are much taller and stronger. If you watch the video you will notice that his swing doesn’t even look that fast, yet he can seriously crush the ball. That’s because he is able to store tons of power in his back swing and he doesn’t release that power until impact. Bottom line…there is no substitute for proper form and knowing when to load your wrist is a big part of this. Now go grab your driver and try this out. For more driver distance secrets Click Here. Fixing your driver swing can be pretty difficult if you just hit drives all day. A full speed driver swing happens so fast you have virtually no time to recognize problems or fix what you are doing wrong. This is where the “bridge stroke” comes in handy. This simple power pitch shot is slow enough that you can diagnose problems, yet similar enough to a full swing that it will fix problems you have with your drives (and even add more distance). In this quick video Golf Pro Bobby Schaeffer will show you exactly how to use the bridge stroke to fix your swing and add tons of power and distance to your golf drives. As you can see in the video the bridge stroke slows down the most common trouble spot in the golf swing. It educates your hands teaching your left wrist to stay flat through impact, while at the same time teaching you to use your core pivot to add power. One of the secrets of this golf drill is keeping your shoulders and neck loose. The power in the golf swing comes from your core pivot not your arms. When you tense up your neck and shoulders you have a tendency to use your arms to hit the ball. Using your arms to swing the golf club robs massive power from your swing. So stay loose and let your core do the work. Just remember to keep that left wrist flat through impact. Don’t let your wrist flop over after impact. You have to keep your left wrist flat into your follow through. Now go out there and have some fun. I know you will get some extra yardage out of this drill. For more information on hitting longer drives Click Here.